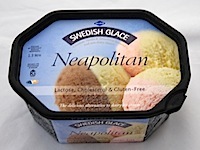 Three flavours of vegan ice cream in a neapolitan style from Swedish Glace. I really love this dairy free ice cream, the strawberry, chocolate and vanilla flavours are just lovely, the ice cream is a very good creamy texture and non vegans I have given it to say they would prefer this to dairy ice cream. Perfect for children and adults, a wonderful vegan dessert. If you want to feel like a kid again, try this with some Jellivita Jelly. Jelly and Ice cream are so good together. Each 1.3litre tub is suitable for vegans, Vegetarian Society Approved. Lactose, Cholesterol and Gluten Free. Per 100grams is 200kcal. Sold in the supermarkets, but it is really hard to find, so whenever I see it I buy it so I do not miss out. I also love their vegan ice cream cornets which I reviewed earlier. Non Dairy Ice Cream Cornets from Swedish Glace (Ingman). I absolutely love these cornets. I have only ever seen them sold in little health food shops as they usually open the box and sell them individually. I buy the whole box and have one every so often from my freezer. 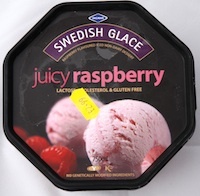 The ice cream is fabulous, very creamy and the strawberry ripple adds a nice sweet tart taste which is lovely. The cornet is a little soggy but it tastes great. 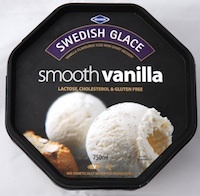 Swedish Glace is my favourite Ice Cream and these don’t disappoint. Perfect for a vegan dessert and I have given them to non vegans and they love them too. Just Yummy. Each Pack of 6 cornets is Suitable for Vegans, a dairy free dessert, suitable for vegetarians, Lactose, Cholesterol an Gluten Free. Sold in little health food shops. 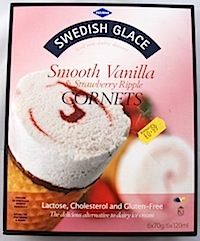 They do some lovely flavours in Swedish Glace which I have reviewed earlier.